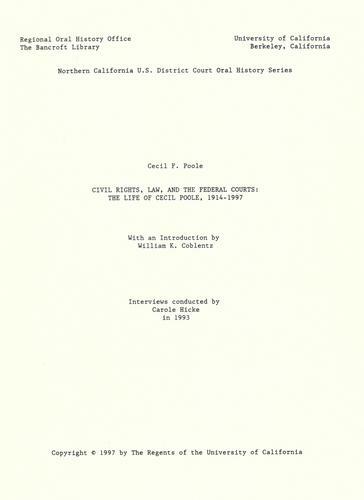 1 edition of Civil rights, law, and the federal courts found in the catalog. Add another edition? Are you sure you want to remove Civil rights, law, and the federal courts from your list? Childhood and education; military service; private law practice in San Francisco; Assistant U.S. District Attorney, Northern District, California, 1951-58; Legal Secretary to California Governor Edmund G. Brown, 1958-61; U.S. District Attorney, Northern District, California, 1961-70; Federal Judge, U.S. District Court, Northern District, California, 1976-79; Judge, U.S. Court of Appeals, Ninth Judicial Circuit, 1979-1997; sentencing guidelines; appellate procedures; challenges for an African-American lawyer and judge; Democratic politics; some significant appellate cases. 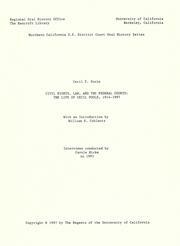 Northern California U.S. District Court oral history series. 1 v. (vii, 248 p.) : 21 sound cassettes.